For your reference, there are 200 g of sugar in a cup. We posted the recommended amount of daily sugar consumption in a separate article. If you don’t feel like baking you can also see our list of low sugar store-bought desserts. Not all sweets are made equal sugar-wise so it is best to choose the ones that have the least amount of sugar. Combine sugar and butter into a large bowl. Beat with an electric mixer until all sugar is absorbed and the mixture is smooth. You may need to adjust the speed from lower to higher as you go. Add eggs and milk and beat to mix well. Gradually add flour, baking powder, and salt. Beat until everything is mixed well. The dough will be soft and sticky. Cover the bowl with plastic wrap and place in refrigerator for about 2 hours. Take about half the dough and knead it a bit in your hands to warm it and form a ball. The dough will be harder initially but as you work, it will become softer. The butter will keep it from sticking to things. Place the ball on parchment paper and flatten it with a rolling pin to 1/4-inch thickness. You don’t need to make perfect circle, any shape will do. Arrange the cookie cutters as close as possible and press them down with hands. Transfer the cookies to a baking pan lined with parchment paper or non-stick silicon baking mat. The cookies will not rise much so you can put them fairly close together. If your cookie cutters are rather large you may need to use a spatula to lift each cookie along with the cookie cutter and transfer them both to the pan. There you just need to lift the cookie cutter or slightly push the dough out. Our cookie shapes are about 1 1/2 inch long and we can just wiggle them in place, lift them, and push out the dough. When you can’t fit any more cutters, collect the remaining dough and combine it with the rest. Continue rolling the dough and cutting shapes until all dough is used. Bake the cookies for about 7 to 9 minutes. The cookies should remain white. If you notice any browning on the bottom you have to take them out immediately. For best results bake on the top rack only, otherwise the cookies on the bottom rack will be burned by the time the ones on the top are done. If you wish to decorate with icing let the cookies cool completely. It does not take long if you transfer them to a large plate. To flavor the cookies you may add a little vanilla extract to the dough. The icing will add some flavor as well. Sugar cookies feel a bit floury at first but as you continue enjoying them you may not be able to stop yourself from cleaning the plate 🙂 Recently we made about 100 small cookies from this recipe and when 5 people enjoyed decorating them there were just 6 left uneaten. 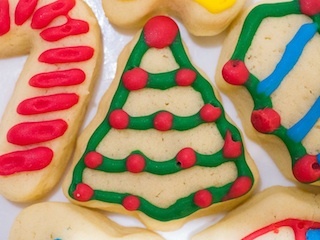 Many sugar cookie recipes aim at producing hard dough by adding just 1 egg. The idea is to have non-sticky dough that is easy to cut. The tradeoff is that the sugar cookies become hard! As you can see here we have 2 eggs and also 2 tablespoons milk for added moisture. This makes this dough soft and slightly sticky. But because of the large amount of butter the dough does not stick much to parchment paper and hands. It may leave traces onto the rolling pin but that’s all. The resulting cookies are soft and chewy. As a matter of fact the softer the dough, the softer the cookies after baking. You can try lowering the amount of sugar you add, but first make the cookies with 3/4 cup sugar to make sure they feel sweet enough for you. People conditioned to consume a lot of sugar will find these cookies not sweet at all. But if you think that 2 cups of sugar per 3 cups of flour is outrageous, then this recipe is for you. This cake is labor intensive so we make it only for special occasions such as birthdays and holidays. It is a moist cake but can be made more dry by omitting the sirup. 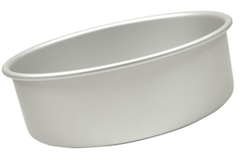 Preheat the oven to 325 degrees F. Grease and flour 9” or 10” round cake pan. We have Fat Daddios’s anodized aluminum 10” x 4” pan and are very happy with it. Fat Daddio’s pans are used by professionals because they provide even baking. They come in many sizes so make sure you select the desired size. Combine the eggs with 1 1/2 cup sugar in a large bowl. Beat with an electric mixer for 15 min at high speed. Gradually add the flour while beating. Do not over-mix but make sure the flour is taken completely. Pour the batter into the prepared pan and bake for 45 – 50 min, until a wooden skewer comes out clean. Cool in the pan for 5 minutes, then turn the cake onto a cooling rack or flat surface to cool completely. We actually flip it to cool right side up. Heat 4 cups milk and 1/4 cup sugar in a double boiler. In a medium bowl mix 3 egg yolks, 1/2 cup milk, and 1/2 flour. You have to get rid of all flour bumps so add just a bit of the milk at first and stir well with a spoon. Pour the egg mixture slowly in the double boiler and stir while it is thickening. Keep stirring while cooking the pudding to prevent it from sticking to the bottom of the double boiler. When the pudding is ready you can add a few drops of vanilla extract. We normally don’t bother. Finally, add the butter and stir until it melts. Cool the pudding before assembling the cake. We speed this by placing the pan in water-filled sink and stirring the pudding there. Mix the cocoa with a bit of water to the consistency of the pudding. Add about 1 1/4 cups of the pudding (a mug’s amount) to the cocoa to make chocolate pudding. Mix well with a spoon. You can double this amount if you wish to have 2 layers with chocolate pudding. Mix the water with the sugar until completely dissolved. For less sugary cake use just water. Cut the base horizontally in 3 parts. We use our bread knife for that. First we trace the lines around the cake base and then go deeper as we rotate the cake. Place the bottom part on a cake pedestal and sirup it if you want a moist cake. Pour about 1 1/4 cups white or chocolate pudding and spread it around. Repeat with the next 2 layers (sirup and spread pudding). At the end, cover the sides of the cake with pudding as well. Sprinkle the cake with your choice of topping. Cover and refrigerate the cake overnight. 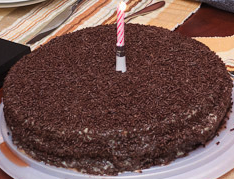 You can add chocolate sprinkles all over the cake but this will increase the amount of sugar considerably. We used to do it this way before we decided to decrease our sugar consumption. Another option is to use ground walnuts instead of sprinkles. A very good alternative are the dark chocolate shavings if you use the chocolate with the lowest amount of sugar: Endangered Species with 88% cocoa (10 g sugar for the whole 85 g bar). 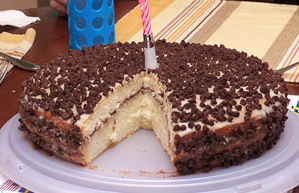 Keep in mind that the cake will acquire different taste depending on the topping. Nowadays we use a bit of the chocolate pudding to decorate the cake and write on it. You can further reduce the sugar in this cake by using just plain water instead of sugary sirup. You can also decrease slightly the amount of sugar added to the pudding. The 1 1/2 cups of sugar for the cake base should not be decreased because this will interfere with the rising of the cake. The sugar cookies look delicious! I didn’t know that the amount of moisture affects how soft they become. I use slightly different recipe but will add some milk and 2 eggs next time. I’m really impressed with your writing skills as well as with the layout on your weblog. Is this a paid theme or did you customize it yourself? Either way keep up the excellent quality writing, it’s rare to see a great blog like this one nowadays. It is a free theme (frontier) but it was customized additionally. Greetings! I’ve been reading your blog for a long time now and finally got the courage to go ahead and give you a shout out from Dallas Tx! Just wanted to say keep up the excellent job!